Want to look beautiful to your husband? This post contains highly effective surah, wazifa,dua for beauty, good & attractive personality.Khubsurat banne ka wazifa aur amal bedaag noorani chehre ke liye. Beauty is of a characteristics that makes a person to experience pleasure, enjoyment and satisfaction. There are two types of beauty found in human beings. One is internal and another is external. Internal beauty refers to softness of heart and how good the person is by his behavior, character and religion wise. External beauty denotes the how fascinating the looks of a person are? How good is he or she in his/her looks and appearance. Are muslims allowed to wear make up? Islam has not stopped women from beautification, rather it has taught the right manner of when, where and for whom to beautify and display it. Inner beauty is of utmost importance to gain closeness of Almighty Allah. While beautifying externally with good intentions will get you reward & it will be considered as an act of worship. But it should be remembered that as muslims we are not allowed to display our beauty publicly to everyone. Instead we should beautify ourself privately at home and display beauty to husband. 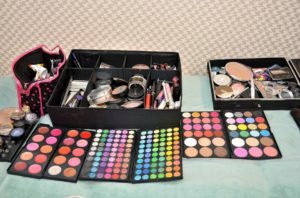 And avoid such beauty products that contain alcohol or prohibited items in them. We can make any good intentions like “I want to beautify myself to implement sunnah. It is said in a hadith that Allah is beautiful and likes beauty. So I am beautifying to please Allah.” Allah likes that the wife keeps her husband happy. So to please Allah and make my husband happy I am beautifying” etc,. On the other hand if some women is applying makeup with an intention of displaying & getting praises from men other than her husband then this is the sinful act. This kind of acts have become very common on facebook these days which must be rectified soon. Which surah to read for beauty? Usually men expect their wives to be gorgeous and also does the women have a desire to always look pretty to their husbands. There are many surahs and wazifas that could be done for increasing beauty both internally and externally. Some of the famous surahs that are read for beauty are Surah Yousuf, Surah Lail, Surah Aal e Imran and Surah Rah’man. 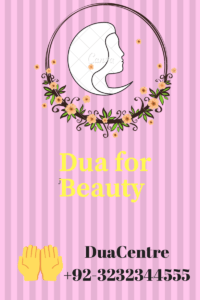 The complete procedure for performing the surahs, duas and wazifas for good and attractive personality are explained in the following section. Then blow it on both your hands and rub them over the entire body. Recite the verse no 4 of Surah Yousuf 313 times. Blow it on olive oil. After you have completed take some lemon juice and mix olive oil in it in equal quantity. Apply this on your face and massage gently. Similarly apply on your hands and body. Take bath after 30 minutes. Another dua of “Ya Nooru” is also helpful and effective wazifa for beauty of body. This wazifa enlightens your face and body with noor. Start this practice with reading Durood-e-Shareef 3 times. Then recite “Ya Nooru” 1000 times. Rub them on your face and entire body. In sha ALLAH you will get noor on your face and body. Another powerful dua for increase beauty is the verse no. 107 of Surah Aal e Imran. Perform the following wazifa after you are done with your obligatory prayer. After every salah read Durood-e-Shareef 3 times. Recite the mentioned verse 21 times. Blow it on both of your palms. Rub them gently on your face and body. The islamic way for beauty is to perform this Quranic dua for good and attractive personality. The amal done by reciting the four verses 56,57,58 & 59 of Surah Rahman. This surah is called as the bride of the Quran because of it’s beautiful verses. If a women wishes to have an attractive personality for her husband, then she may perform this wazifa. Recite the mentioned verses 111 times. Blow it on kohl(surma),perfume and beauty products that you use. Keep doing this daily for 41 days. After you have finished the amal you use the products to beautify yourself before going in-front of your husband. Awwal 3 martaba Durood-e-Shareef padhein. Surah Al Lail 7 martaba padhein. Phir apne dono haathon par dum karke saare jism par pheirlein. In sha ALLAH muraad poori hojayegi. assalamu alaikum… How many days we have to perform this wazifa?? and which time it is to be performed?? Bhaijaan aap muje chehre ke til ko hatane or chehre se lalpan ko door karne ka koi qurani powerful wazifa bataye .Me inki bajah se kafi pareshan hu please meri comments ka reply Dena.aap muje [email protected] par gmail par Dena.sir yehi mere pass rahta hai sirf aapka wazifa or me kafi pareshan hu . Please comment ka reply jarur Dena. Bhaijaan me chehre se kafi janda pareshan me bhut se wazifa karke dekh liye lakin koi wazifa se muje sita nahi mili hai please aap koi qurani dua bataye jisse muje sita mil sake bhaijaan me apke jabab ka intjar karunga.